Verizon’s variant of the new Moto X (Moto X+1) cruised through the FCC last night under the codename “victara,” a name we saw back in June. 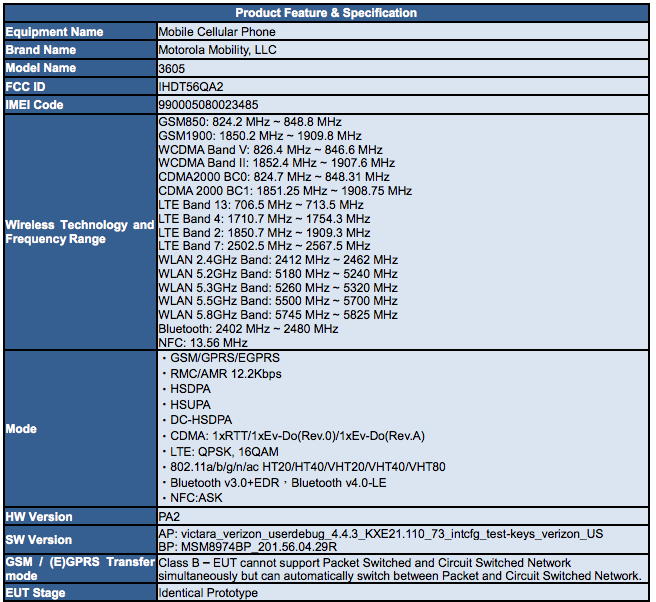 The device measures in at the same size as the AT&T/GSM model we saw hit the FCC last week, so even though the listing doesn’t say “Moto X,” we would be surprised if this isn’t it. Plus, Motorola is set to unveil the device in a day, so we like the timing. The listing doesn’t give us a ton of new info, although, we are still digging through it. So far, we are seeing support for Verizon’s CDMA2000, along with LTE 13 and 4. The device, like almost all Verizon phones these days, has global GSM roaming on bands 850 and 1900. The listing does mention specifically the codename of “victara,” which I just mentioned, while also confirming the device for Verizon with Android 4.4.3 on board. We are also seeing a mention of the MSM8974BP as the chipset powering the device, which is a Qualcomm Snapdragon model number. The question now is, which one? Is this the Snapdragon 800 or the 801? The Snapdragon 800 falls under the general model number of MSM8974, but the 801 is the MSM8974AC. This could be another custom job by Motorola and Qualcomm, just like we saw with the Moto X from last year. If we can confirm which, we will. Asus Announces the ZenWatch, Designed to "Start With People"
Samsung Announces the Galaxy Note 4 and Galaxy Note "Edge"